The Royal Pavilion in Brighton is officially my favourite palace in the UK. It’s not the biggest, nor does it currently have Royals sleeping in the beds; but what it does have is insane interior design. The interior is Chinese inspired, with walls painted to look like carved jade, nodding Chinese statues and dragons everywhere. I love the balls/creativity of the designer, when he couldn’t source real bamboo (or just didn’t want to use it) he just painted other wood to look like bamboo. The Pavilion was built over many years by George IV; a womanising drunken lout with no responsibilities, too much public money and gout. He built it as a pleasure palace, with all the space in the world for entertaining but conveniently no room for a spouse (which may be the reason Queen Victoria only stayed a few times during her reign, she was a bit fond of Alfred after all). The room which I fell in lust, love and heavenly delight with was the banqueting hall. In a room covered in dragons, hybrid Chinese-English paintings, Masonic symbols and more gilt than even Napoleon could have dreamed of, it is the chandelier that stands out. It is 30ft high, hung with 15,000 shining crystals, has six dragons breathing out glass lotus lamps instead of fire, a giant mirrored sun disk and is all held in the claw of a 12ft FLYING SILVER DRAGON. This is the extreme opposite of understated elegance. Also of note is the music room with a ceiling of 10,000 gilt cockle shells (and another incredible light fitting), the modern kitchen*, Queen Victoria’s bed and King George’s bedroom full of hidden doorways. 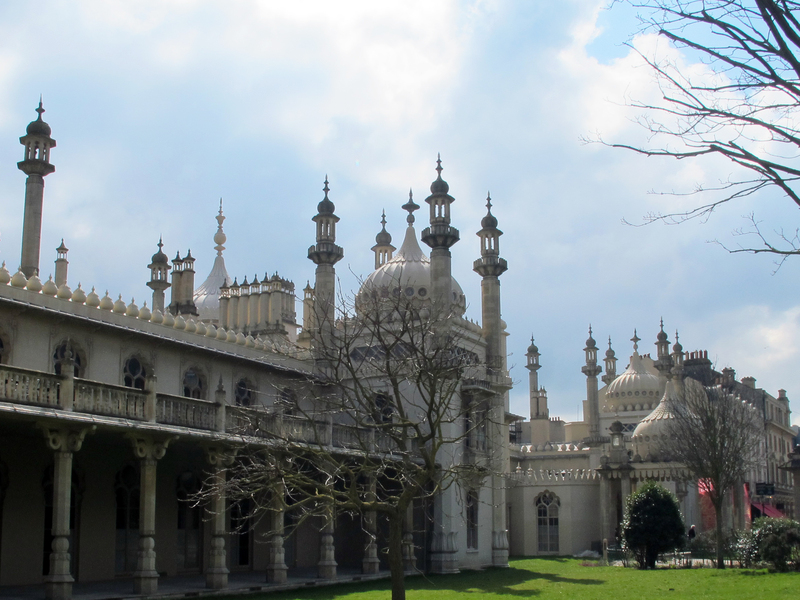 To read more about the Brighton Pavilion, take a look at the posts by their resident blogger Chris. P.s. the Royal Pavilion was also used as a military hospital for Indian soldiers during WW1. The beds were all lined up in the fantasy world that is the banquet hall, can you imagine recovering while being watched over by a giant silver dragon? *modern because it is right next to the dining hall and not in another building as was common at the time. Oh and the ceiling of the kitchen is held up with four copper palm trees, just casually…).